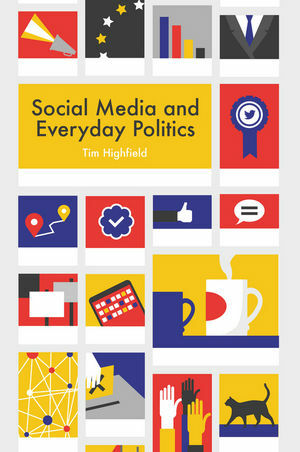 In Social Media and Everyday Politics, Tim Highfield examines political talk as everyday occurrences on Twitter, Facebook, blogs, Tumblr, Instagram, and more. He considers the personal and the political, the serious and the silly, and the everyday within the extraordinary, as politics arises from seemingly banal and irreverent topics. The analysis features international examples and evolving practices, from French blogs to Vines from Australia, via the Arab Spring, Occupy, #jesuischarlie, Eurovision, #blacklivesmatter, Everyday Sexism, and #illridewithyou. Politics is personal and the personal is political. As new media platforms enhance our ability to express ourselves and connect with others, everyday politics are performed in public spheres interconnected by social media. Tim Highfield makes this abundantly clear in Social Media and Everyday Politics, a must read volume for those interested in how the language, the practice, and the meaning of political expression evolve in contemporary societies. His approach offers rich theoretical terms, methodological insight, and analytical rigor to our understanding of how social media reorganize political realities. This is an excellent book. It is comprehensive and up-to-date. It is a great introduction to social media in general Ð but especially delivers handsomely on its topic of everyday politics and social media. The range of examples and cases are terrific and well-analysed. I especially like the authorial voice Ñ grounded, funny, lively, sharp. Of special interest to sociology, journalism, and political science scholars, the internet studies encompassed in this book bridge the gap between these disciplines by showing the interaction among them. "This book is a great introduction to the everday politics of socia media, and the vibrant discussion of important issues makes it worth a read for students and scolars at any level." "It would be difficult for me to imagine a better orienting text for my undergraduate courses on internet culture and politics. It fills an important gap in the existing literature and I suspect will find an eager and engaged audience." the existing literature and I suspect will find an eager and engaged audience.